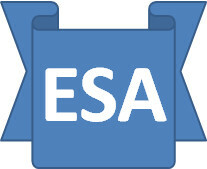 The ESA Saga: Work Experience has a some value. Trainees of any kind in the work place are often seen by junior management particularly as annoying to say the least and a huge distraction. There is no denying that to do the training job well, it takes a considerable amount of thought and time to put a programme together that allows the trainee to get the most out of it and sadly, many can’t be bothered. The first manifestation is usually that the trainee turns up only to find they were not expected – rarely true, more commonly the case that the person who was notified just forgot to tell anyone else. Not off to exactly the best start and it goes slowly downhill thereafter. Much of the day ends up being spent with a broom in hand or doing whatever task is the perennial standby – that job that does not appear in any job description or on any work plan, but nevertheless has to be done from time to time. By comparison, shelf-filing is most certainly one notch up, but only a small notch. I would not therefore be at all surprised to find that the employers currently being criticised for using “slave labour” did not join the scheme with exploitation in mind and have been let down by the quality of the front-line implementation. Yes, they are required to make a profit, but the net saving here is minimal in the overall scheme of things and the risk of damage is relatively high as they are now finding out.